For many years, men and women have been using the exercise called "sit-ups". 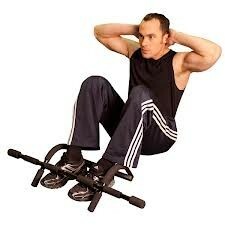 Sit-ups are one of the most popular exercises in all over the world and you've probably done it before in the past. Military basic training and fitness also uses this exercise as well and it has been working very good in the modern times. They can be very good for you sometimes but citizens around the world say it's bad for you and they're the worst exercise ever invented. Actually, the worst exercise that who ever invented should jump off of a cliff bad. Even trainers in America say they don't ever use it in any workout. Now you're probably wondering why it's so bad as people think it is and how good too. Well, lets see. This exercise might help your muscles but not as well as many other exercises. Sit-ups done without strengthening the back muscles, such as the extensors, can lead to muscle imbalances, which can lead to low back pain or strain. Everybody wants to have a good posture and doesn't want a terrible back. Sit-ups ruins your back and can give you a poor posture. The belief has been said that the hip flexors movement causes instability in the lower back. "Unless you are wrestler, a gymnast or a diver....you will never move this way. Except for getting out of bed in the morning, this is something we just don't do." - Dan Swinscoe, MPT, CSCS. Another reason why it bad is because, when you do sit-ups, you place a tremendous amount of stress on the vertebrae and deep muscles are being harmed too. 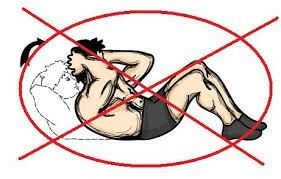 So when you do sit-ups, make sure to be very careful with your back and try to keep a healthy body. It may sound awful but there's some interesting facts on why it's for you. According to the Vince Gironda, they shock your sternum and lower hormone. Some of the comments on bodybuilding.com always say they use it because it helps their abs. One comment said, "Sit-ups help strengthen the slow twitch fibers of the abdominal muscles". Which is very important when you workout or trying to stand up. Doing sit-ups the original way is the worst way. There's a lot of ways to do it but here are some that is the best: Use a pull up bar, sitting diagonal, and on a rubber ball. If you try those three then you'll have a proper posture and no more back pains.